David Thiessen has a developmental disability and is legally blind. Glaucoma has eroded his vision over the past few years. But he would love to have a paid job. Listen: David tells his story [2:42]. A new program in Vancouver, offered through the John Howard Society of the Lower Mainland, is working with Thiessen and people like him to try to make that happen. Kelly Yip started the Grassroots Employment Program a year and a half ago as a flexible, “no-barrier” program for people with developmental disabilities. “The whole idea behind Grassroots is that if someone wants employment, they should be able to find employment. We want to provide that opportunity for our clients,” she said. The John Howard Society is most commonly known as an organization that helps people who have been in prison integrate back into society. But another part of its mandate is to provide community support for people with developmental disabilities. Over the past decade, that side of their operation has been growing in B.C. In this province, half of the agency is now devoted to these types of services. The number of outreach workers in the Lower Mainland has increased from two to nearly 30 since 2002 and the number of clients has increased from 20 to approximately 150. Yip said Grassroots strives to be as inclusive as possible, with none of the restrictions to entry — such as age and diagnosis — that some employment programs have. Kelly Yip and David Thiessen at the John Howard Society in Vancouver. transition from high school into employment, Grassroots fills a gap for older people, who may not have had enough career support when they were younger. It is also open to people with challenges such as addiction as well as people with disabilities — such as fetal alcohol spectrum disorder — that are not necessarily easily diagnosed. Yip currently has 19 clients. They struggle with finding employment for a variety of reasons, one of which is the increasing prevalence of online job applications. If people get through the application process, interviews are another challenge. “Sometimes, because of their disability, they can’t always explain or answer the questions in an interview. Their first impression isn’t accurate of who they are and their abilities,” Yip said. Another challenge is a lack of job opportunities. 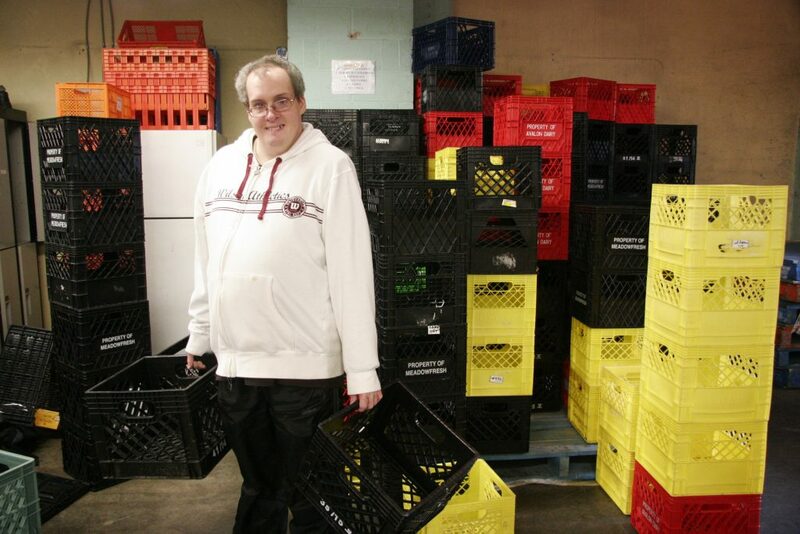 According to Community Living British Columbia, a Crown agency that provides funding to services for adults with developmental disabilities, many employers still don’t know enough about hiring people with disabilities. “A lot of employers haven’t hired somebody before who’s had a disability so they don’t know how it works,” said Shelley Gerber, provincial employment co-ordinator for the organization. Gerber said many employers don’t know what a person with a disability would do in their workplace. “And then sometimes it is this worry: ‘What if I bring somebody into my workplace and they can’t do the job? Am I stuck with them?’” she said. She said such fears are unwarranted. “You do your best to get them into the right job so that they can use their skills in order to move forward. But if somebody isn’t a fit for a job or in a workplace then it doesn’t make sense to keep them on,” she said. 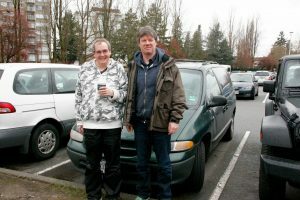 David Thiessen and Jim Stanley on a job hunting excursion. Three years ago, CLBC initiated a three-year plan to increase the rate of employment for people with developmental disabilities. Gerber said since then, the number of people on provincial disability assistance who reported employment income increased from 15 per cent to 23 per cent. “I think we have seen change. We are seeing increases and that is encouraging,” said Gerber, whose agency acknowledges that many factors are likely involved in that change. But Gerber said there is still more work to be done. Yip says she sees the Grassroots program increasing her clients’ confidence. “Some of them have never worked before, not even volunteered, have never made a resume before,” she said. Yip said that volunteer work and paid employment gives her clients an opportunity to contribute back to their communities. “If they’re making a living, they’re also being able to support themselves which is a huge boost in confidence and empowerment,” she said. Cathy Grant and David Thiessen in the warehouse at Quest Food Exchange. placement at Quest Food Exchange, a local non-profit grocery store. Co-workers say he has grown since he first started sorting and organizing groceries there three years ago. “David has shown up consistently and reliably for years now. That’s why he’s so special,” said Cathy Grant, who has worked with Thiessen at Quest since he first started. She said turnover is high among volunteers at Quest, but Thiessen has been a reliable, continued presence. Grassroots also provides Thiessen with support as he looks for paid work. Thiessen completed the Grassroots employment workshop when the program first launched in fall of 2014. He returned to the program this year to work one-on-one with Yip. They meet regularly at the society’s Kingsway office to talk about which businesses Thiessen wants to apply to, while he continues with his part-time shifts at Quest. Then he goes out with his outreach worker, Jim Stanley, to drop off applications. They’ve been job hunting for a month now. Thiessen is hoping to find a job in a grocery store. He compared job hunting to riding a horse.